Skincare is something that I’m really into, I love trying new products to help out with any skin concerns and whilst skincare may seem like a chore to some people, I love having a mini pamper session at the end of the day. 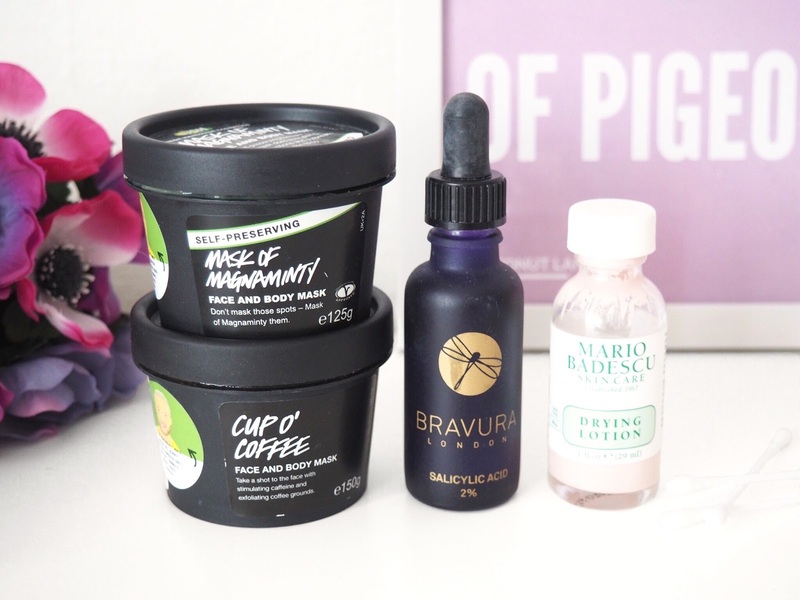 Whilst it may have taken years to find the perfect combination of products to tackle my combination skin, I think I’ve finally found it so today I thought I’d share my skincare routine with you. For reference I have combination skin meaning that I get oily in my t-zone and dry everywhere else, however this hasn’t always been the case – especially during my teenage years! When I was younger I struggled with super oily acne prone skin which was helped by a course of tablets from my doctor (Lymecycline I believe they were called). 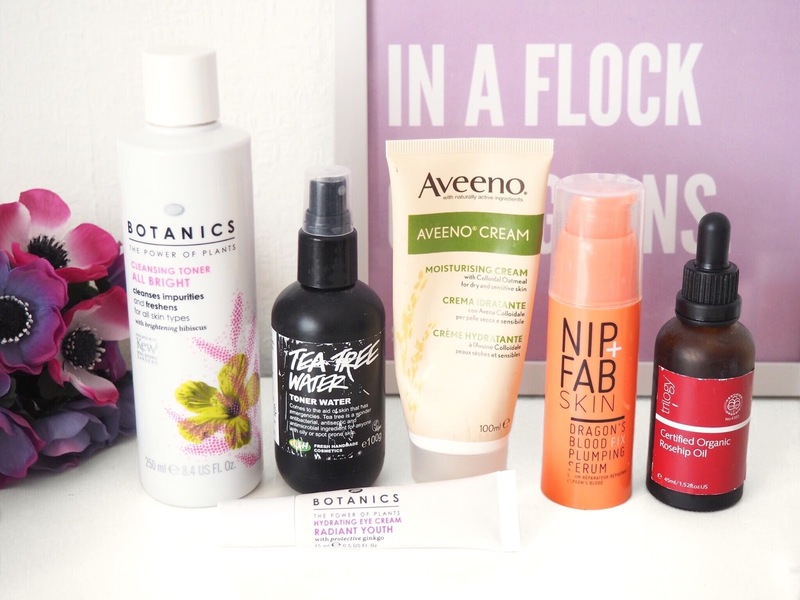 Whilst it got rid of most the blemishes I still do get the occasional one but it’s nothing these products can’t fix. To start off with I like to remove my makeup and cleanse my face. 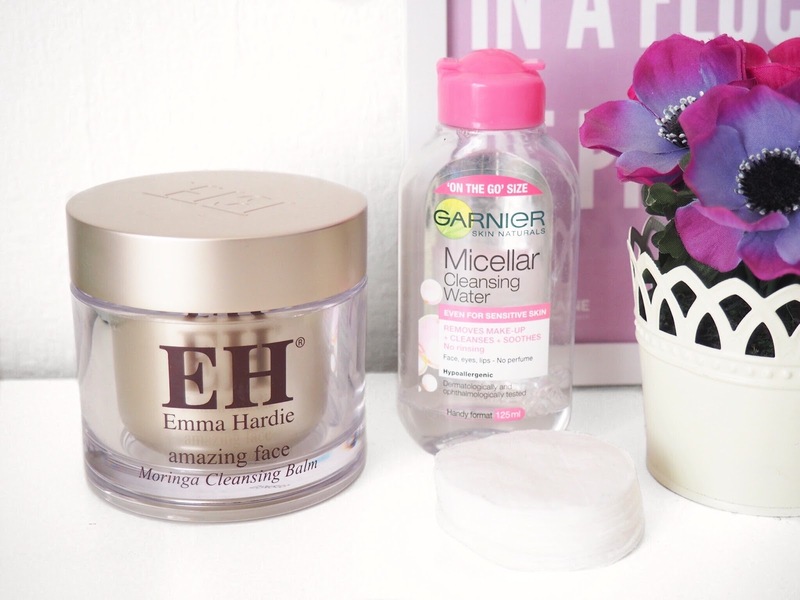 Firstly I take some Garnier Micellar Water on cotton wool pads and remove as much of my eye and face makeup as I can. After that I like to use the Emma Hardie Moringa Cleansing Balm which I apply to my face and then remove with a warm face cloth. If I’ve worn a lot of makeup that day I’ll go in and cleanse again to make sure I’m removing as much of the makeup as I can. Whilst the cleansing balm is crazily priced I can’t be without it and this massive pot lasts forever, it’s still well over halfway full and I’ve had it for about 3 months now. Up next is masks and treatments. Whilst I don’t use these products on a daily basis, it’s after cleansing that I like to apply them when I do. When it comes to masks, I always tend to stick with LUSH. My two favourites and the ones I’m currently using are Cup O’ Coffee and the Mask Of Magnaminty. Cup Of Coffee is my all time favourite face mask, it’s exfoliating without being drying and leaves my skin feeling super soft. If I don’t have time to leave it on I do like to use the mask as a quick exfoliator just buy applying a small amount to my face and removing it with with a damp cloth. The Mask Of Magnaminty is also a great mask that I’ll use if my skins being satanic and blessing me with breakouts. It’s perfect for tackling blemishes and I tend to use it on my t zone or on problem areas as it can be a bit too much for my dryer areas. I also like to occasionally use is the Bravura Salicylic Acid on any areas I may have blackheads or larger pores and it’s SO good! It is strong and has some pretty detailed instructions on how to use it but it’s well worth getting to grips with how it works – I won’t ramble on about it here but it’s amazing! Another product that’s only recently joined my skincare routine but already earned holy grail status is the Mario Badescu Drying Lotion. It’s perfect for blemishes and I simply apply it after moisturising with a q tip and leave it overnight to work its magic. In the morning the blemishes are smaller and a hell of a lot calmer, I couldn’t recommend it more! After cleansing my face or using a face mask/treatment I like to tone and moisturise my face. When it comes to toning I like to use the Botanics All Bright Cleansing Toner all over my face and then the LUSH Tea Tree Water on my t zone, it’s great for helping control oily skin. After allowing my toner to absorb into my skin I apply my serum and the one I’ve been using for about a year now is the Nip + Fab Dragons Blood Serum which is apparently a firm favourite of Kylie Jenner… I like to think using this will give me skin like hers! It’s actually a really nice serum and does leave my skin feeling softer and plumper however the scent is rather strong and does take some getting used to. As for moisturiser my favourite to use in the evening is the Aveeno Moisturising Cream. Whilst it is on the thicker side I find it’s perfect to use in the evening as it has plenty of time to hydrate my skin overnight. If I have any areas of super dry skin then I love to use the Trilogy Rosehip Oil which works wonders on pesky dry skin. To finish off I like to apply eye cream and my current favourite is the Botanics Radiant Youth Hydrating Eye Cream which hydrates my undereye without irritating my rather sensitive eyes. 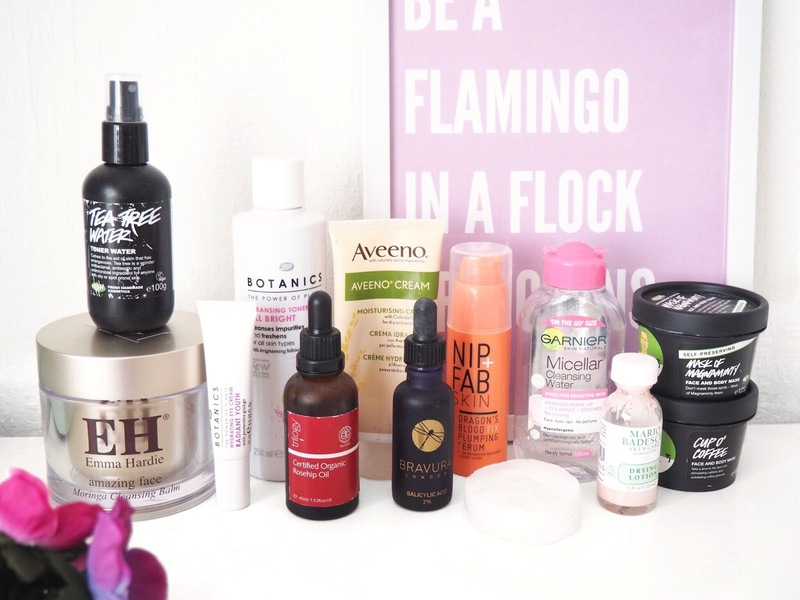 So that’s my evening skincare routine, I know it was a rather lengthy post so I tried to keep it brief! Let me know what some of your skincare staples are in the comments below!